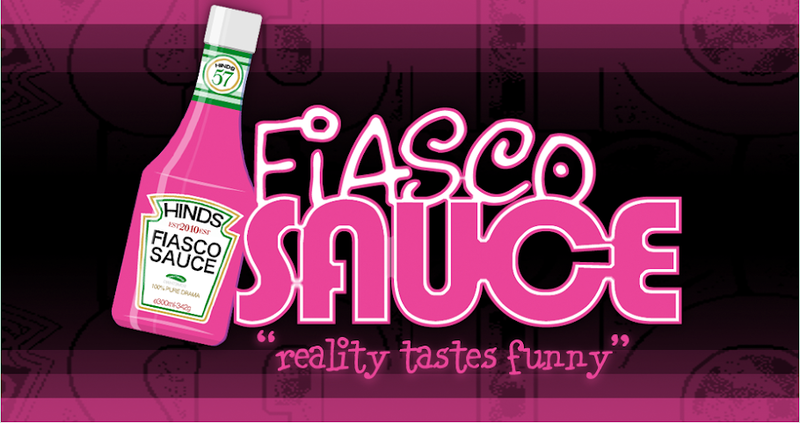 Fiasco Sauce: Hoarding and Bridezillas ... I watched both! Margaret is a married mother of a 20-year-old and is a typical hoarder ... and in typical hoarder fashion … she saves everything whether it’s broken or useless. The sad thing is that her poor son is the former and her husband is the latter … maybe from all the hoarding. As a “normal” hoarder, Margaret can’t throw anything away, and even when she does have help … she must touch or see everything before it leaves her home. The process is agonizing for everyone and painfully slow. She says she wants to “fix it,” but she seems to derail the process every chance she gets. For example, there is a broken microwave in her kitchen (underneath several other microwaves that may or may not work … not really clear) … and she tells her husband she wants to get rid of it. He’s thrilled. I’m thrilled. We’re making progress. Then she gives him explicit directions on how to move the microwave from the kitchen through the mounds of crap to get it outside. She reminds him not to touch or bump or move anything. She begins to “clear” the way for him to move the microwave. And by clearing the way, I mean moving junk in his way so he can’t move the microwave out of the house. She then gets frustrated at HIM because he’s moving it too fast, stuff is in the way, HE’S not listening, and on and on. I don’t know what happened to the microwave. Next thing you know, the “show” tells us that the family is making progress and Margaret is moving things out and the family can now eat at the kitchen table. Whatever. It still doesn’t look good to me. Laura, the other “hoarder” featured on the show has three little kids and a husband and supposedly has suffered from postpartum depression. After watching numerous “hoarders,” I think Laura is on the wrong show … she should be on that messiest home show or the Biggest Loser or something like that. This lady doesn’t seem like a hoarder to me … she just seems sluggish, unorganized and overwhelmed. Her house is quickly cleaned up and her husband goes from “hopeless” to “happy” pretty fast. Her parents were there to help, she had an organizer, she has a husband … I’m not giving her the “hoarder” label … maybe packrat. Definitely lazy. On Bridezillas this week, we had really sweet brides compared to some of the train wrecks I’ve seen on this show. Stephanie was a 26-year-old bossy perfectionist who was planning a royalty-themed wedding because she is a “queen.” Whatever. Stephanie’s poor groom-to-be was pulling double shifts at his job to help pay for her wedding. I just felt sorry for the poor guy for so many reasons. The funniest thing about Stephanie is that she was having her bridesmaids pulling double duty at the wedding … you are a bridesmaid AND the backup florist. You are a bridesmaid AND the caterer. Kendall was the other featured bride-to-be … a 23-year-old whiner who just couldn’t get enough attention. When she was having her trial run for her “hair” or something prior to the wedding, she was demanding that her bridesmaids all join her and no excuse would work on why they couldn’t be by her side through every “moment” … work, sick kids, holidays … she accepted none of it. At Kendall’s actual ceremony, she had the lamest DJ ever … and we all knew it. OMG, he played the Electric Slide when she had forbidden it! 1. They seem to have a plethora of bridesmaids because as soon as one pisses them off … off with their heads and on to the next one! 2. The F bomb. Really? At church? 3. They hate their sisters and their best friends. 4. They have no money. They have no taste. 5. Crying is always acceptable. 6. Men will put up with a lot for love. Next up … Teen Mom I believe. Can’t wait to see what Gary does next. This is Laura, from Hoarding on TLC. I would like to remind all of you that there is a lot of editting that is done to allow the show to last only an hour. I admit I also am guilty of quick judgments, but unless you see the entire situation you really are not in any position to declare if a diagnosis was wrong, or to tie any labels to a particular person. What you didn't see was my frustration at the fact that I could not handle of this on my own; the fact that I had applied for Clean House (and am apparantly still in consideration for next season); the fact that a lot of my extra weight came on while I have been trying to deal with everything, and that I lost 15 pounds between the before and after taping; the fact that I was able to have the kids in daycare during most days between the before and after taping; the fact that I was working on the house for anywhere from 10 to 20 hours a day during those weeks; the fact that there is nothing Niecey Nash could have said to me that was anywhere close to the things I said to myself for the way the house was; the fact that I have a one-car-garage size shed filled to the top with things for a garage sale (I have come to terms with these items not being mine and will never bring them back into our house); most importantly the fact that I knew I was headed down the path that lead to my home being as bad and worse than the others shown on this show and I didn't want to wait until it was that bad before getting help. One reason my home was chosen to be on the show as to show that this is a situation that anyone can be in, you do not need to wait until you are at risk of eviction before dealing with it. I will say that the only real negative responses I have gotten from the show are those anonymous forums and comment sites on the internet that allow people to say anything they want, giving the opportunity for the commentor to feel superior because they can make any statement they would like without having to deal with the truth. Some people relish the opportunity to make snap judgments and cruel comments when there is not real response and they are not then forced to look at themselves and how they treat others. As far as my being unorganized and overwhelmed, yes I am! As far as me being sluggish, yes I am, I am also battling depression and working very hard to deal with my issues. As far as being lazy, you couldn't be farther from the truth! That is the worst assumption people make about hoarders. If we were truely lazy than we wouldn't have all of this stuff, it takes a lot of energy to be a hoarder! As far as my weight, yes I am very overweight, I would love to be on the Biggest Loser. I have always struggled with my weight and being a hoarder is just another snagg in my struggle. I would like for everyone to understand two points: 1) hoarders are not lazy and 2) just becuase a hoarder is also fat does not discount the fact that they are a hoarder. I could see how bleak my future might have been and I wanted to make a change now before I let it get so bad. There are those people who will knock me down because I made this choice, but I don't really care. I knew I needed help and I went about getting it in the best option available. I knew I did not want to end up like the severe stories that are often featured and that I wanted better for my family. I am a hoarder, that doesn't mean that my home will magically be filled to the point to satisfy some stranger who wishes to evaluate me based on 20 minutes on the show, it does mean that I have issues I need to deal with. I saw a problem (that took me a long time to admitt) and I opted to seek out help before it got so bad. I have a family and I didn't want them to continue to suffer until our home was to the point where it would be acceptable for some to be considered a hoarder's home. My house was not cleaned up quickly, it was 6 weeks of hard work and it only got half-way done. My husband did not go from hopeless to happy in an instant. I don't understand why you feel he should have been anything other happy during the "after" taping. You have seen 20 minutes of our lives, now that you seem to have enough information to declare a licensed psychiactrist is wrong, why don't you spend 20 minutes re-evaluating yourself and see if you can decide if you really are qualified to make those kind of judgments.